There are six essential elements for successful digital marketing and when used together they make for a powerful combination. Each element is important on its own, but when you use all six together you will see a strategy that is effective, scalable and long term. Website -- A professional website is the single most important step towards your digital marketing plan. Your website is your homebase, so make sure it is updated regularly and is current. Use your site as a platform for all other activities. Post your blog and photos along with links to your social networks. Always remember your audience when developing content. If a person cares enough to come to your site, you need to make sure their trip was worth the effort. eNewsletter -- email is still the most powerful digital tool. Every single author should have an enewsletter. You should collect as many email addresses of your readers as you can. Overtime email addresses of your readers will be a huge asset. You can communicate with your readers through a regular enewsletter sent either once a month or once every 3 months. Just keep those lines of communication open. Blog -- A blog is the best way to share your expertise and drive traffic to your site. Use your blog on your own website along with posting it on an important high-traffic website as a guest post. Everyone needs content, and it never hurts to ask a popular blog if they want to run your blog post. Blogs don't have to be long, 500-700 words tend to be the most popular lengths. Facebook -- Every author should have a Facebook fan page so they can socialize and communicate with their readers. It's an important element of digital marketing and honestly at 520 million people, you can't afford to ignore it. Along with being a great place to build community, Facebook fan pages also offer Insights a great tool for monitoring your audience and your interactions. Video -- There is not a better or easier way to show your passion and personality than video. It can be fun content for your Facebook fan page, your blog, and your website. Remember to post it on YouTube as well. Twitter -- I know many authors are intimidated by Twitter, but it's a fabulous way to share resources and develop a following. I find Twitter to be an incredible tool for listening and for doing market research. You can listen to your readers, find out what other people are doing and saying, and build a relationship with current and future readers. If you chose not to participate in digital marketing and social media, you are only hurting yourself and your readers. 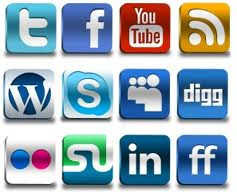 There are millions of people on social networks; they don't miss you, but you are missing out if you ignore them. Digital marketing is a wonderful way to connect with people who care about your work. Just remember that all six elements of digital marketing working together will produce the best results. There are no short cuts here, but it is all well worth the investment of time and attention. SOURCE: Fauzia Burke for Huffington Post. Burke is the Founder and President of FSB Associates, a publicity and social media firm specializing in creating awareness for books and authors on the web.